Dr Mohan Shenoy graduated from Mangalore University in India in 1994 and has trained in Paediatric Nephrology in Newcastle upon Tyne and Manchester. He was appointed Consultant Paediatric Nephrologist in 2008. He was also appointed as an Honorary Lecturer Manchester Medical School at the University of Manchester in April 2010. 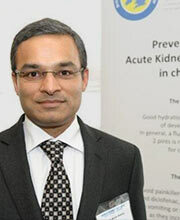 Dr Shenoy has extensive experience in all aspects of paediatric nephrology. His special interests include transplantation, HSP and renal tubular disease and he has several publications in this area. He is a member of the Royal College of Paediatrics and Child Health. Dr Shenoy is actively involved in Undergraduate and Postgraduate medical education.